Edinburgh is famous for its New Year Celebrations. 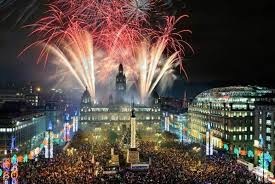 Known by its Scottish name, Hogmanay, the city receives nearly 150,000 people every year. It doesn’t matter if you’re coming with your children, a group of friends, or just with your partner for a romantic break, there’s plenty to keep you entertained. We’ve highlighted a few worth checking out if you’re planning on welcoming 2019 in Scotland’s capital. 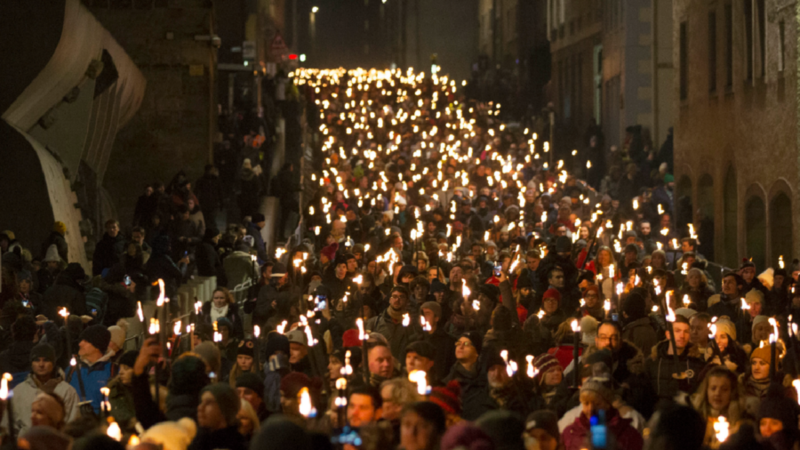 An impressive celebration with Viking tradition, the torchlight procession is generally seen as the kick off to Edinburgh Hogmanay celebrations. Torchbearers march through the city holding flaming torches accompanied Viking performers playing pipes and drums. The procession starts at three different points (High Street, South Bridge and North Bridge) joining at the Royal Mile and walking down Holyrood Palace and the Scottish Parliament to end in Holyrood Park. The conclusion of this year’s procession will be led by a group of young people to close the Scotland’s Year of Young People. You can still find some peace and quiet during the Hogmanay celebrations. On New Year’s Eve, the impressive St Giles Cathedral, in the heart of the Royal Mile, will host the traditional Candlelit Concert. Music and scenery will be perfectly paired in an event with an atmospheric recital by the St Giles’ Cathedral Choir and St Giles’ Camerata. Highlighted as one of the ‘Top 100 things to do before you die’ and the only festival recommended in the ‘Discovery Channel – Top 25 World Travel Experiences’, Edinburgh’s Hogmanay Street Party is one of the world’s greatest New Year celebrations. With live music, DJ’s, street performers and more to keep you entertained in the build up to midnight. Celebrate the bells surrounded by the spectacular backdrop of Edinburgh Castle. Watch as the sky illuminates with the impressive firework display, and join in with those around you for a rendition of Auld Lang Syne. Get ready to welcome in 2019 by enjoying live music from Franz Ferdinand in Princes Street gardens. Tickets to the concert include street party access and you’ll be able to enjoy amazing views of the fireworks. Looking to experience a traditional Scottish Ceilidh? Then this is for you. Enjoy Strip the willow, dashing white sergeant and much more with a full traditional ceilidh band set just under Edinburgh Castle. Don’t worry if you don’t know the moves, there are callers there to help and plenty of local food and drink on offer to keep you dancing long after midnight. Plus, you’ll have the best views in the house of the fireworks. A spectacular evening at the Edinburgh Royal Botanic Garden. It includes a five-course dinner followed by after-dinner dancing, Welcome in the New Year with a piper and traditional toast. The views of the fireworks show from Edinburgh Royal Botanic Garden will be extraordinary. Dance the night away in one of Edinburgh most prestigious venues. The Snow Ball Ceilidh at Assembly Rooms on George street is the biggest indoor Hogmanay event in Edinburgh. Whirl and twirl away in one room with a traditional ceilidh, fancy something different then head next door to the contemporary mix. Bring in the bells with amazing views of the fireworks. Still going when the Ball finishes at 1am, then don’t worry - you’ll get free priority access to Shanghai Nightclub, just a few minutes’ walk away. The Loony Dook, the annual splash in the River Forth, South Queensferry, is a great way to clear your head after the night’s celebrations. Dress up and take part in the Dookers Parade through the high street before taking the diving (or slowly walking) into the icy waters. £1 from every ticket sold will go to the Royal National Lifeboat Institution, the charity that saves lives at sea through lifeboat search and rescue, lifeguards, as well as providing water safety education and flood rescue. 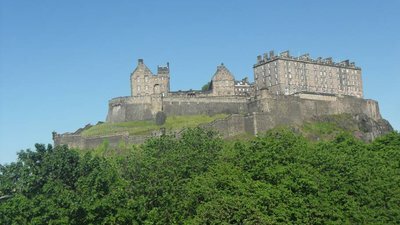 If you don’t fancy the hustle and bustle of the street party, there are plenty of spots throughout Edinburgh that you’ll get amazing views of the fireworks. 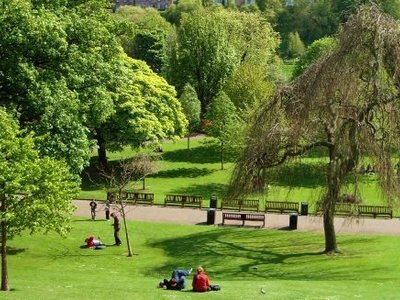 Our favourites are Inverleith Park, Calton Hill, Arthur’s Seat and The Meadows. The festive period wouldn’t be the same without a trip to the panto. Loved by kids and adults alike, this year’s show is Beauty and the Beast. Running from 1st Dec - 20th January you can enjoy this classic panto at the King Theatre, one of Edinburgh iconic venues. Named the best in the UK in a survey conducted by McCarthy & Stone in 2017, Edinburgh Christmas Market is a beautiful explosion of lights, Christmas carols and bright colours. Located in East Princes Street, a visit to the Christmas Market is perfect for both adults and children. You’ll find special gifts, meet crafters, as well as enjoying festive Christmas food and drinks from all around the world. Among its fabulous attractions you can take a ride in the 33-metre high Big Wheel, near the Scott Monument, and the mini ice rink at St Andrew’s Square. Edinburgh is very child-friendly with plenty of activities for the little ones. If you're planning on buying tickets for anything, it would be worthwhile to check there aren't any restrictions. For example, children are welcome to the Torchlight Procession, however buggies are not permitted. Also, the Street Party doesn’t allow children under 12 and those under 16 must be accompanied by an adult over the age of 21. Most Edinburgh New Year celebrations are within the city centre, whilst this is handy for revelers, it does mean there will be some transport restrictions in place. Just be aware bus times / routes may vary and taxis are worth booking in advance. Scottish weather can be unpredictable, especially in the winter months. With an average temperature of 5°C you’ll need warm winter clothes, waterproofs, hats, gloves, scarves and an umbrella. Check the forecast a couple of days before your arrival and this will give you a good indication of what to expect. Don’t worry if it rains. Edinburgh has lots of indoor activities to keep everyone entertained. We’ve put together a few suggestions of things to do in Edinburgh when the weather is bad. From seafood, to Angus beef and everything in between. There’s plenty of amazing places to eat in Edinburgh. If you’re planning on eating out during your visit it’s worth booking in advance, especially on New Year’s Eve or Day as these can be particularly busy. However all our flats have well-equipped kitchens so you can also enjoy a meal at home. 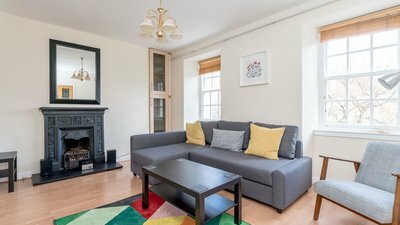 We have a wide variety of short-term self-catering flats for rent in Edinburgh. 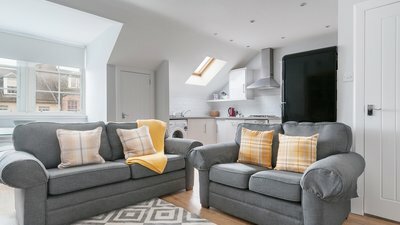 Why not browse our flats? Feel free to contact us if you have any questions, or information. We’re here to help and ensure that you find the perfect holiday rental for your trip. Edinburgh's Hogmanay is where the world comes to party! And we're looking forward to celebrating with you.